This Friday, I’ll be speaking at the Webvisions conference in Portland about Internet memes, how they spread, and how their distribution’s changed over time. As part of that research, I’ve been digging into my original server logs from the Star Wars Kid debacle, five years after I played a major role in what some say is the biggest viral video of all-time. Be warned, this is more detail than you’ll ever want about the origins of the Star Wars Kid meme and how it spread. You don’t care about this level of detail, but I’m writing this all down so that I never have to think about it again. On April 27, a mostly-NSFW online community called Sensible Erection linked to the video on Bryan’s website. Later that evening, an SE user cross-posted it to a private file-sharing community I belong to with the new filename “star_wars_guy.wmv.” It quickly became the most popular file on the site, which is where I found it the following day, April 28 at 7:52pm. On April 29, I renamed it Star_Wars_Kid.wmv and posted it to my site at 4:49pm — inadvertently giving the meme its permanent name. (Yes, I coined the term “Star Wars Kid.” It’s strange to think it would’ve been “Star Wars Guy” if I was any lazier.) An hour later, Scott Gowell becomes the first person to link to the video. From there, for the first week, it spread quickly through news site, blogs and message boards, mostly oriented around technology, gaming, and movies. Throughout the life of the meme, most of the referers are blank, suggesting people were primarily sending the links by email or instant message. 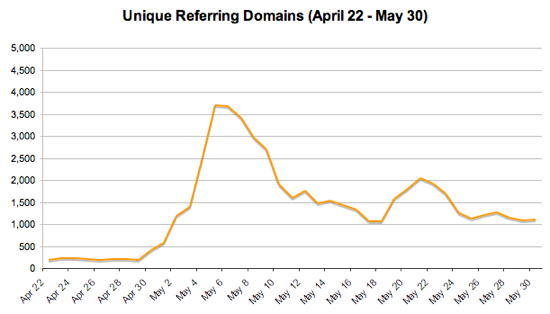 The chart below shows the distinct top-level domains that appeared in the referral logs grouped by day. Here’s some of the highlights from the mainstream media coverage. The New York Times was the first major paper to report on it, almost a week after I tracked Ghyslain down, Jish and I interviewed him for the first time, and we started the fundraiser. Here’s what the Star Wars Kid meme did to my overall traffic. 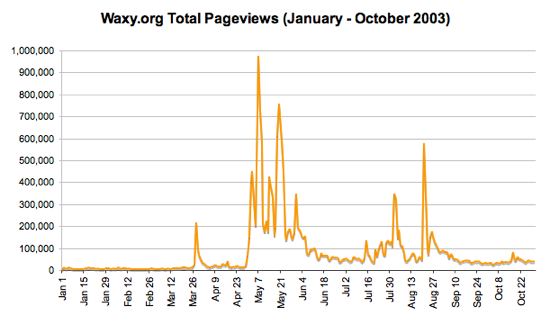 At its peak, I received almost a million pageviews in a single day. That includes all pageviews on my weblog entries. 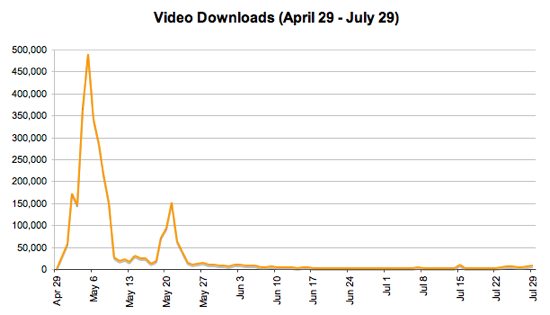 Isolating only the video downloads from my site, or later redirected to one of the mirrors, gives the following chart. This file is a subset of the Apache server logs from April 10 to November 26, 2003. It contains every request for my homepage, the original video, the remix video, the mirror redirector script, the donations spreadsheet, and the seven blog entries I made related to Star Wars Kid. I included a couple weeks of activity before I posted the videos so you can determine the baseline traffic I normally received to my homepage. The file is 158 megabytes — 1.6GB uncompressed — so I’m distributing it with BitTorrent. The data is public domain. If you use it for anything, please drop me a note! Yes, but what about the _details_? What is this secret cabal that you speak of? I feel really bad for the guy though. The guy actually goes to my school, and seems to have been really traumatized by the whole thing – all the ipods and court-settlements in the world aren’t worth that kind of notoriety. Maybe its time to leave the poor guy alone. I totally agree. When it became clear he wasn’t interested in the attention, I took the videos down and refused all press interviews. I encourage others to do the same. This entry isn’t about Ghyslain or the content of the video, though. It’s about how information spreads on the Internet, and the diffusion of one of the most popular viral videos of all-time. Remember Arrested Development! Are we sure the kid’s not George Michael? It’s very interesting to note how that spread… thanks for consolidating this data. Great timeline and dataporn. Funny, I remember eating curry with you and the gang, discussing both the memetic and ethical aspects of the Star Wars Kid craze… I can’t believe that was 5 years ago. To this day, I still get about 1-2 “media requests” for information on Ghyslain … usually asking for his contact info or if I know of his current whereabouts. Much like Andy, I deny them all. Interesting graphs. 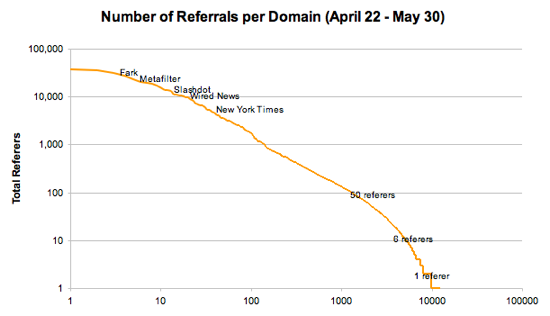 Any chance of a log-log plot of the Number of Referrals per Domain? As it is it’s hard to resolve anything useful. Good call, I changed the chart. That’s a lot better, thanks, but if the x-axis were on a log scale too it would make it even easier to distinguish the top half a dozen referers and, assuming it’s a power law, the curve would be more or less a straight line. Zipf’s Law would suggest a gradient of approximately -1 but I’d be curious to see how close it came. You should remove the poor guys real-life name from this webpage. It adds little, and if anything perpetuates the abuse the guy got. Funny you should say that, since I’ve never mentioned his last name on my site, until today. I’ve referred to him in seven entries, always by his first name only. I even renamed the file when I first posted it in 2003 so his full name wouldn’t be revealed. 80 mainstream articles have used his full name, including the New York Times, USA Today, Globe and Mail, Seattle Post-Intelligencer, Associated Press, NPR, International Herald Tribune, Newsweek, Forbes, BBC News, Variety, and the San Francisco Chronicle. Plus, his name was used in the lawsuit, making it a matter of public record. Five years later, I don’t think stating the original filename of the video (which misspells his last name) makes much difference, and it’s relevant to anyone researching the early history of the meme’s distribution. Hi, which tool did you use for the log file analysis ? I wanted to say thank you for making this data available. I used it as a demo for what Spring Batch can do at the latest SpringOne2GX. I took the log files, loaded them into a database, geocoding the IPs as I loaded them so that i could generate a map of where the video was being viewed from. Nothing super complex, but it made for a more interesting demo than most of the other large datasets I came across online. You can view the deck here: JSR-352, Spring Batch, and You. Can you provide the header information of the log file. Which field signifies what ? Could anyone seed the torrent? Many thanks! The torrent now 404s….has it been deleted or is there a new URL for it? Currently pointing to Wayback Machine archive, but prefer canonical authoritative source.